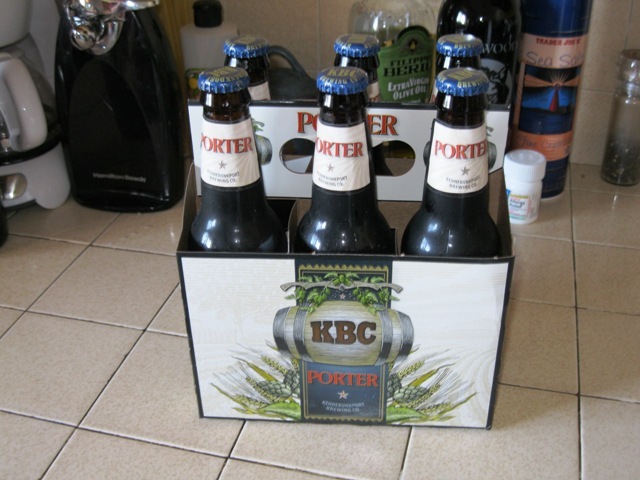 Stopped by the Trader Joe’s the other day and came across a display for Kennebunkport Brewing Co. Porter. 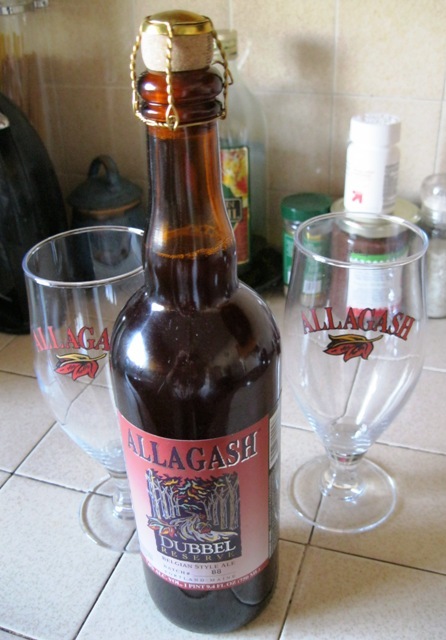 Yes, Maine beer in California. 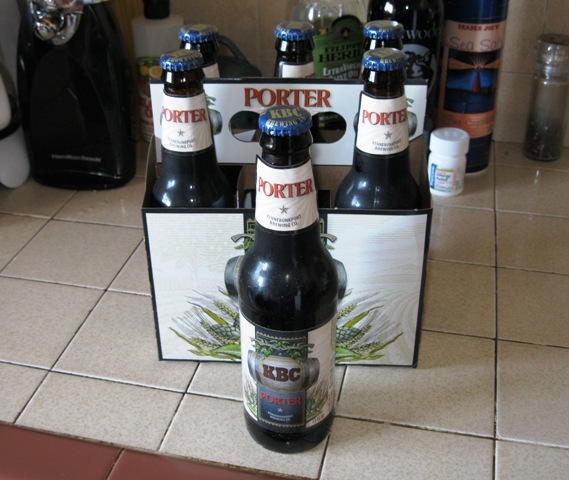 More importantly, now Maine beer in my California apartment. 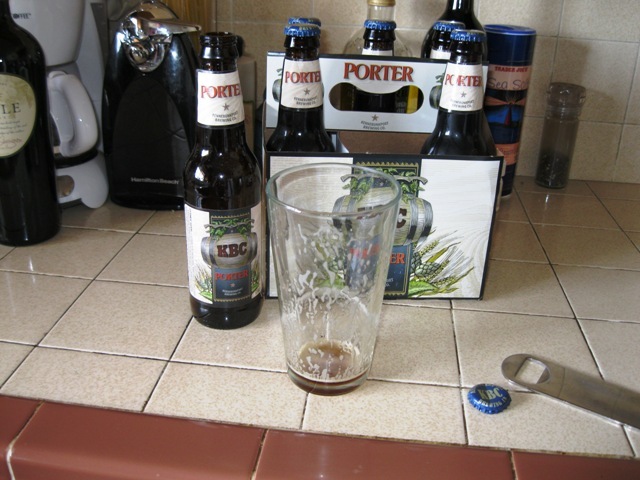 As you can tell from these photos, I didn’t take much time in tasting the beer. I’m not a huge porter fan. 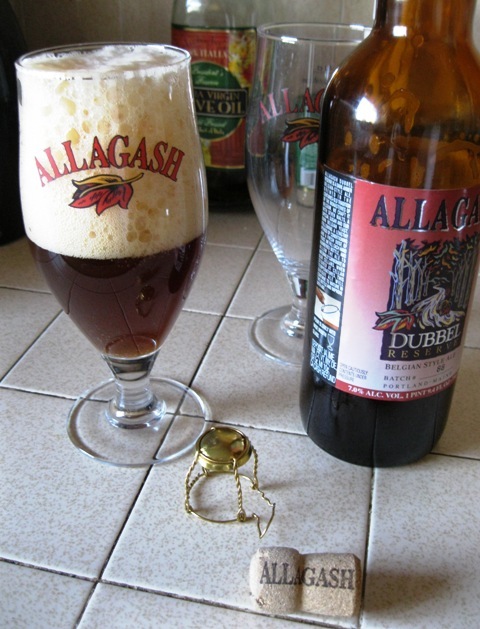 I’m more for pale and amber ales and European lagers and other lighter beers. Guinness is the only deep dark beer that I enjoy. 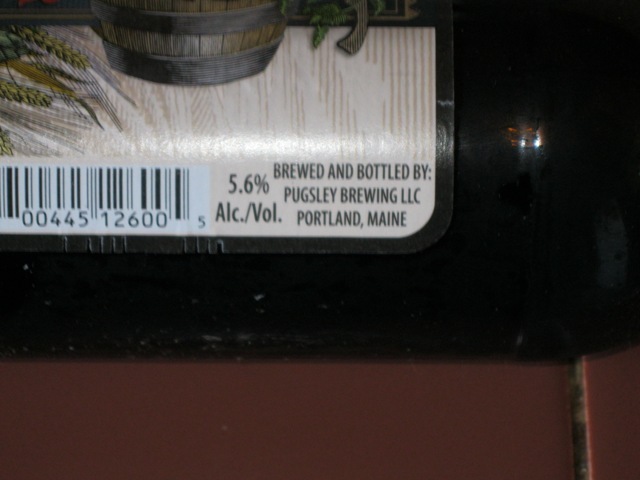 However, I found the Kennebunkport Brewing Co. – brewed and bottled in Portland by Pubgsley Brewing LLC – was much lighter than I would have expected and flavorful. 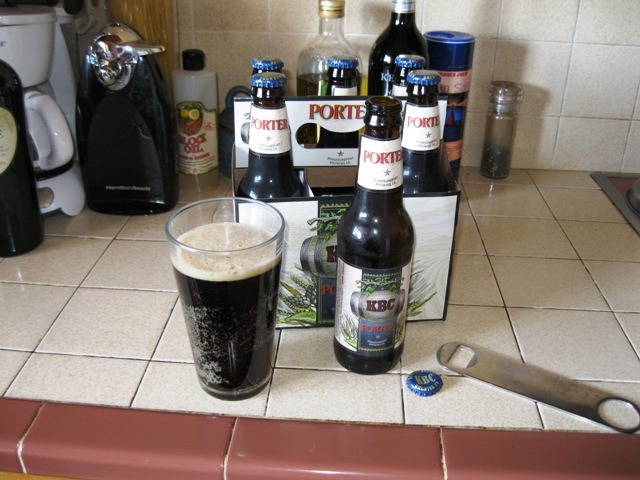 I enjoyed it – as the photos below might suggest – and I intend to purchase more of the beverage. 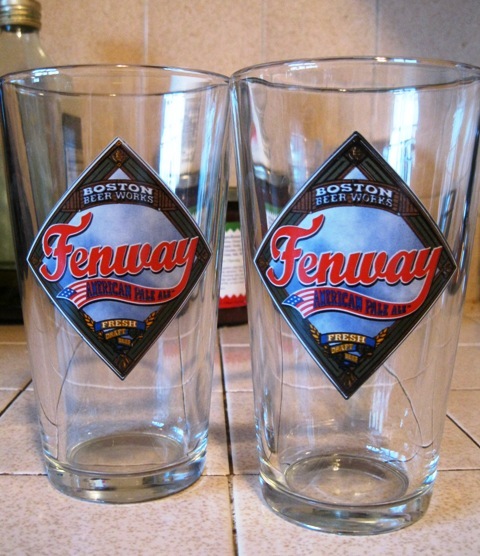 I have to say, BevMo and Trader Joe’s are keeping me in touch with Maine brews. And I am impressed. 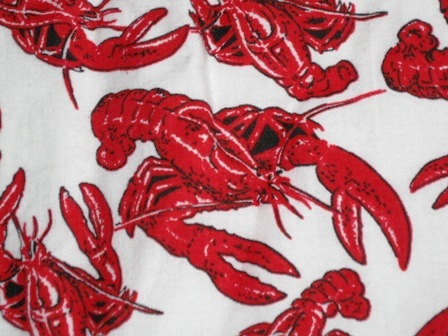 The other day I was wearing Maine stuff on my sleeve – and back and front and … . Well, you get the idea. I woke a couple of days ago, had breakfast, showered and pulled on a T-shirt that just happened to be Maine stuff in my California apartment. It is a gray University of Maine Black Bears T-shirt. 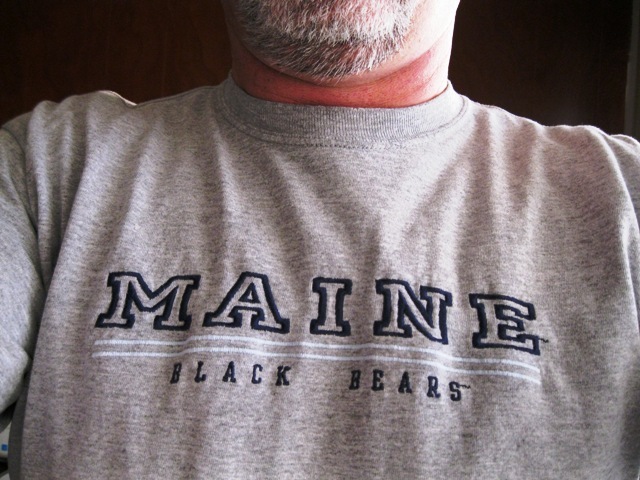 University of Maine Black Bears T-shirt. The university in Orono is the largest in the state system, I believe, and has a fine reputation as a state institution of higher learning and for some of its sports teams. It also is involved with research in alternative energy and providing housing – tents – for deployed servicemen and women that are more resistant to explosives than current housing. It’s a cool enough shirt, as you can see from the photo. 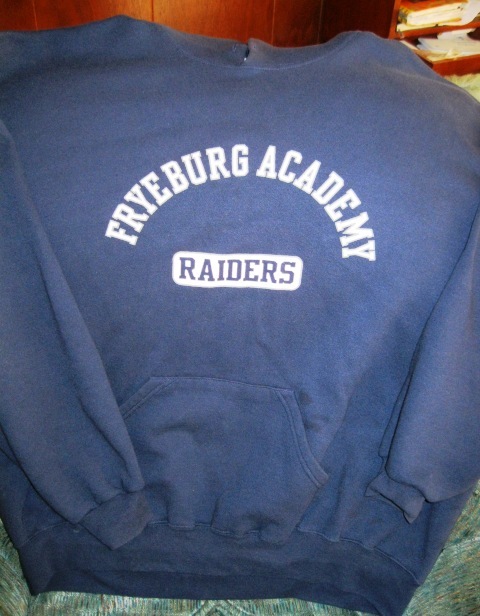 And as I was stepping out the door, I pulled on a Fryeburg Academy sweatshirt that my sister sent me a couple of years ago. Fryeburg Academy, in Fryeburg, Maine, is a college prep school and has a fine reputation. I like the sweatshirt very much. So, I have plenty of Maine stuff. I have not added an installment of this feature for quite some time. That does not mean that I have run out of Maine stuff in my California apartment; it just means I have been distracted by other things. But I wanted to add this entry before we moved too far beyond the blueberry season, which probably ended about a month or so ago. 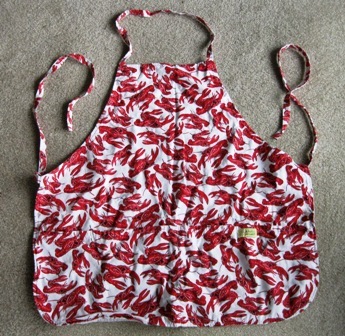 Beginning years ago and over the course of several Christmas seasons, my family sent along to me several aprons, oven mitts, and dish towels printed with reminders of Maine. 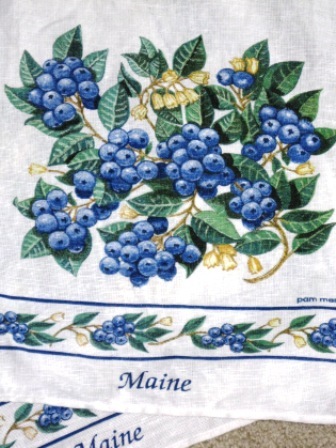 Several, of course, were printed with the famed Maine wild blueberry. It may still be the case – I’m not sure – but once Maine wild blueberries accounted for very nearly all wild blueberries. And by “all,” I mean the entire world’s annual harvest. So blueberries are something we Mainers, whether living in our homeland or “from away,” discuss with a certain amount of pride. 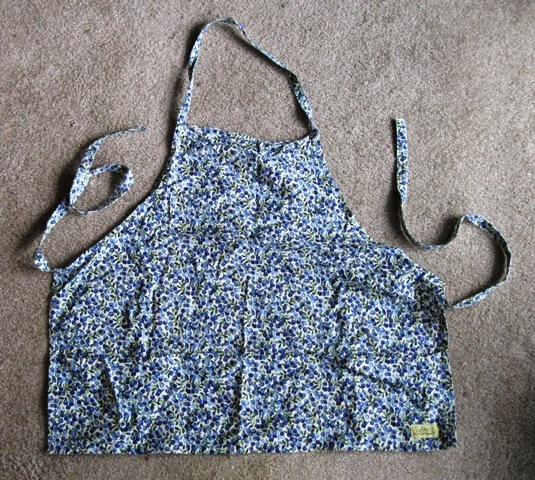 Today’s photos include the apron, dish towels and an oven mitt on which Maine blueberries are printed. 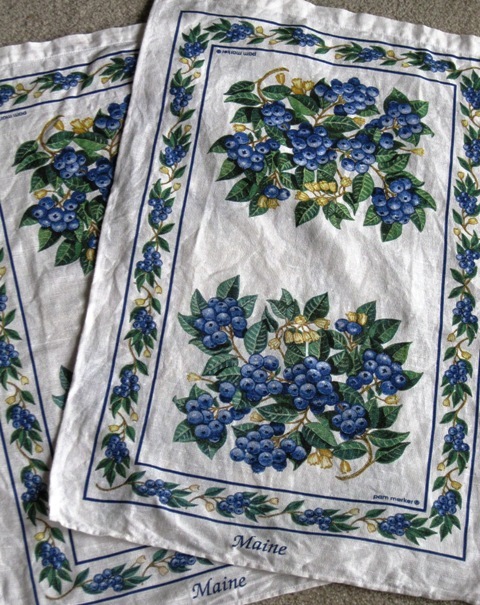 For full disclosure, the dish towels never have been used as dish towels, simply as ornamental accents in my apartment’s kitchen. 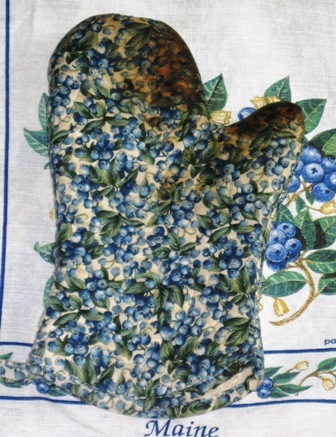 And the lone – and rather well used – mitt has a mate, but I cannot seem to find it. I know it is here somewhere, but I’m just not sure where. 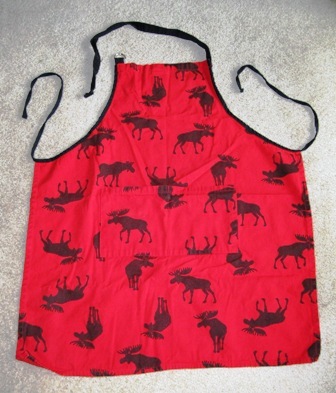 By the way, I do have two other aprons on which Maine symbols – on one, lobster, and on the other, moose – are printed. 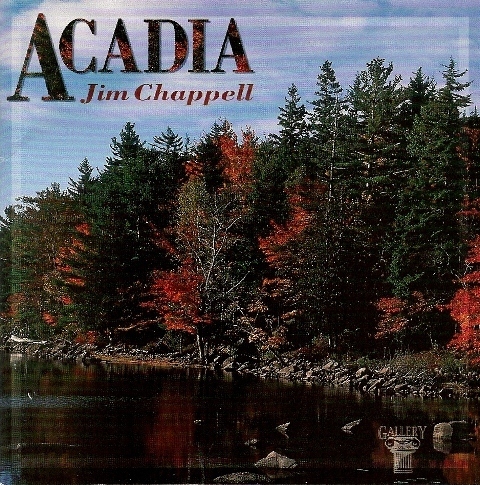 Scan of a CD by Jim Chappell inspired by Maine's Acadia National Park. Today’s photos – scans really – are of a CD cover and a couple of pages from the accompanying booklet. 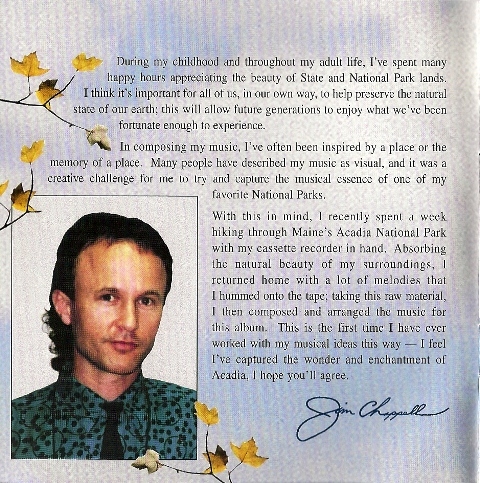 It is an instrumental CD by Jim Chappell that came out in 1996, I believe, and was inspired by Acadia National Park. My mother gave me the CD as a gift many years ago. I don’t recall if it was a birthday gift or a Christmas gift or just a gift from out the blue. Moms do that from time to time, give gifts for no reason at all. The music is very soothing, relaxing and comfortable to listen to – piano, violins, cello, French horn, flute, that sort of thing. It’s not Radiohead or The White Stripes, but not everything has to be. The CD had been lost among other CDs on a bookshelf that I recently went through. I’m listening to the CD at the very moment that I am writing this entry and I’ll very probably hit replay once it plays through. Scan of one of the pages from a booklet that came with the CD by Jim Chappell. It’s been a very long time since I’ve been to Acadia National Park, but that passage hits it pretty well on the head. I don’t recall the part of “lighthouses flash like fireflies,” but it was a pretty long time ago. It is Maine, after all, with lighthouses on nearly every other coastal bluff. The CD carries song titles that will be familiar to those who have visited Acadia National Park: “Cadillac Mountain,” “The Carriage Road,” “Southwest Harbor,” “Long Pond Canoe,” “The Loop Road,” and “Jordan Pond,” among others. Scan of another page from a booklet that came with the CD "Acadia" by Jim Chappell. 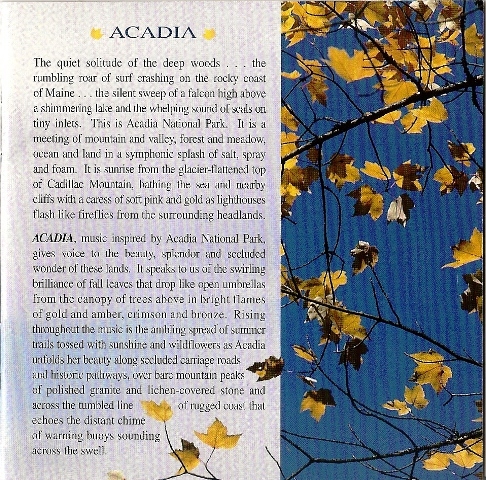 The CD was inspired by Acadia National Park. 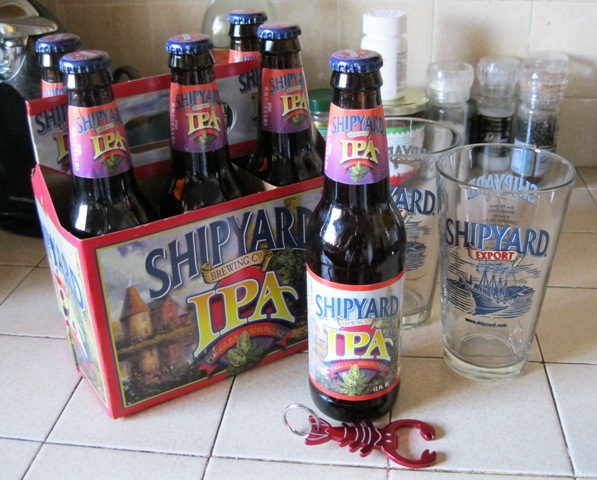 For total disclosure, I am again stretching the whole Maine-stuff-in-my-California-apartment thing with this entry. The album was inspired by Acadia National Park as Chappell spent a week hiking around Acadia and humming into a cassette recorder – remember, this was in 1996 and it was a little early for digital recorders – the melodies that became “Acadia.” But the booklet indicates the music was recorded in California – Sebastopol and San Anselmo. 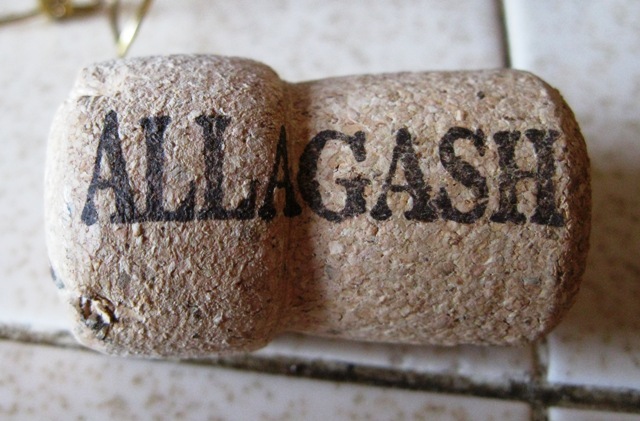 Let’s just agree that it is Maine-inspired stuff in my California apartment. I tracked down what seems to be Jim Chappell’s official website, where you can find more information about the guy and order his music. Apparently, he’s still at it and his latest CD is being released later this month. The booklet also mentions Friends of Acadia, a nonprofit organization working to preserve Acadia National Park. According to the booklet, 15 percent of the profits from the sale of the CD go to the group. Donations to Friends of Acadia can be made by mailing them to the group at 43 Cottage Street, P.O. Box 45, Bar Harbor, Maine 04609. There’s also information about the park, how to join Friends of Acadia, and more on its website. 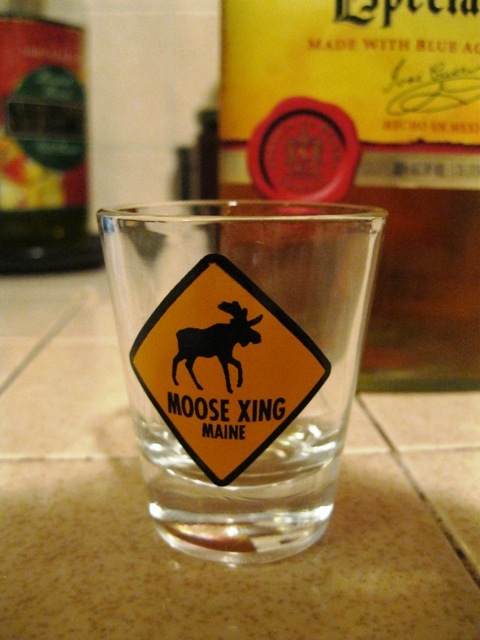 Today’s photos are of a moose shot glass. 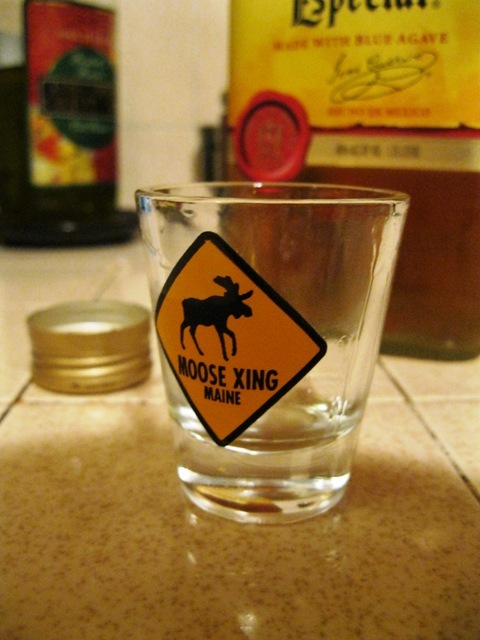 I really should have included it with the other moose entry, but I forgot I had this shot glass. I don’t do shots quite like I did in my younger day. Found moose shot glass rinsed and ready for tequila. I don’t recall where or how I received this shot glass. I very probably purchased it on one of my last visits to Maine and I very probably purchased one like it for my friends Rick and Michele. I was pulling down another glass from a high shelf in my glass cabinet in my California apartment when I spotted this shot glass and another with an image of the University of Arkansas hog. That was a treasure from Rick and Michele following a visit to his native Arkansas. Moose shot glass filled and at the ready. Since I had some Jose Cuervo Especial left over from margaritas I decide to use the glass for a single shot of tequila. (And, yes, it was just one shot.) It went down nicely. Aww, just a slight bit of tequila residue left behind. Today’s photos are of a package from home and its contents. But in all fairness to The Sis, she is a wife, mother of two very active children, Max and Sophie, and has a full-time job. She’s busy. My Mom – known as Mems to The Sis’s two very active children – is busy on her own what with grandchildren to spoil, friends to visit, bowling balls to throw, books to read, a dog’s ears to scratch, and box wine to drink. Don’t get me wrong. It was a lovely surprise. I knew the package was coming and that it might be a while longer, so it truly was a lovely surprise nonetheless. And very much appreciated. 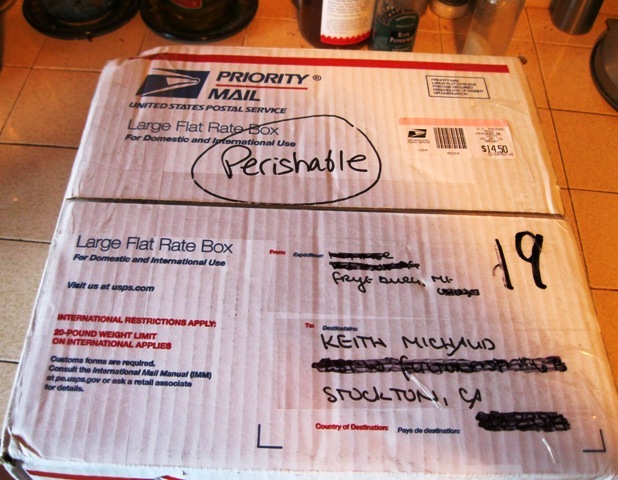 Here’s the package straight from Fryeburg, Maine. Well, perhaps not straight-arrow straight, but close enough. 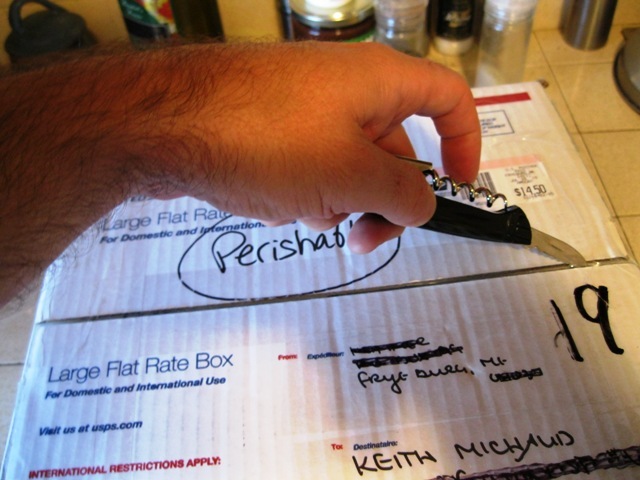 Yes, that is me using a corkscrew to open the package from home. It was handy and recently had been used, so I knew it worked. The package from home was waiting for me yesterday when I returned from a day at empresso coffeehouse, the coffeehouse I frequent the most. It is located in Empire Theater on the Miracle Mile in Stockton, Calif., and hence the name of the coffeehouse. I go there for the reasonably priced and reasonably tasty caffeinated beverages, friendly baristas, and WiFi I use for the protracted job search and to keep in touch with personal and professional contacts. 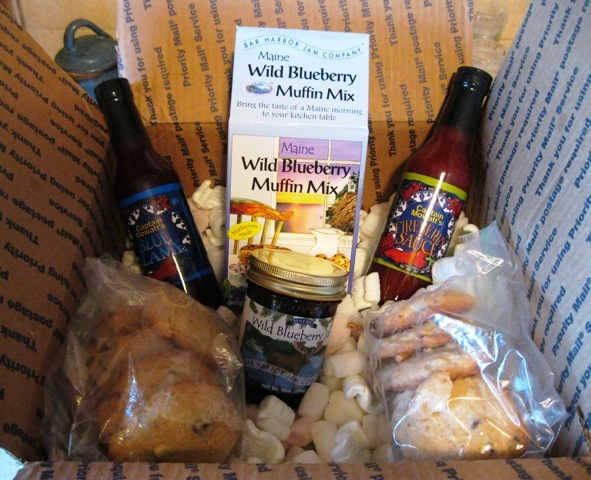 Inside the package from home were three Ziploc bags of chocolate cookies, Bar Harbor Jam Company Maine Wild Blueberry Muffin Mix, Bar Harbor Jam Company Maine Wild Blueberry Jam, Captain Mowatt’s Blue Flame and Captain Mowatt’s Fireberry Sauce. Trust me on this, it is all yummy stuff and I will enjoy it all. However – and it’s only a small “however” – I have asked several times for no more sugary treats. I’m closer to 50 than I would like and it is getting harder and harder to keep the weight off. The last thing I need is sugary treats. To Mom and The Sis I thank you. Here's another Maine thing in my California apartment -- a Fryeburg Academy sweatshirt. It was a gift from my nephew Max and niece Sophie. 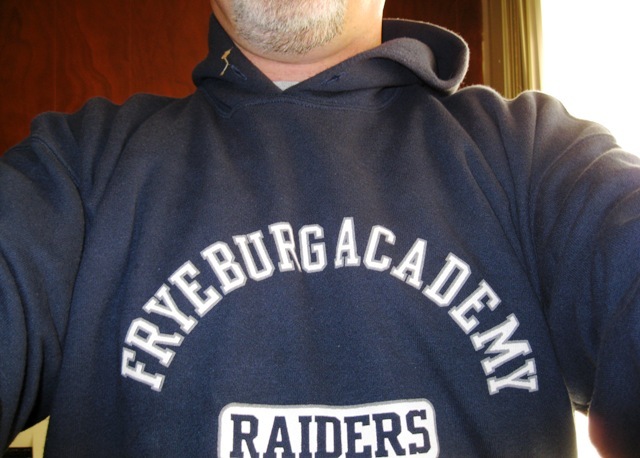 Today’s photo is of a Fryeburg Academy sweatshirt I received as a present from my nephew Max and niece Sophie. The long-term plan is for Max and Sophie to attend Fryeburg Academy, a private preparatory school located in Fryeburg, Maine, the White Mountains. I say “long-term” since they are not quite old enough yet to attend. Fryeburg has a long and rich history. John Hancock – yeah, a signer of the Declaration of Independence – signed the charter in 1792 and Daniel Webster was a headmaster of the school. And here’s a link for the school’s history. 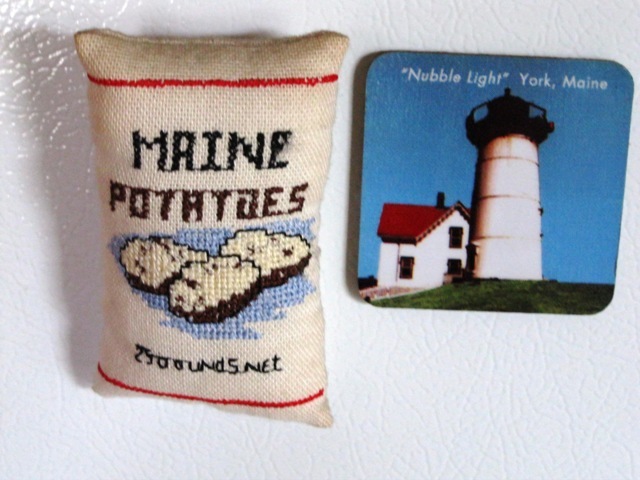 These to Maine magnets hang on my Caifornia refrigerator. Potato farming is big in Maine. It was even bigger when I was a kid, I believe. I’m pretty sure farmers have moved to other crops such as sugar beats and soybeans over the years. My Mom sent me the potato bag magnet years and years ago in a Christmas or birthday package. The other magnet is of Nubble Light in York, Maine. I know I didn’t visit Nubble Light or purchase the magnet and have no idea how I came to have the magnet. I have had it for years; it used to hang from a metal light shade above my desk when I worked at The Reporter in Vacaville, Calif. Not sure why I keep it around; it has no sentimental value, except perhaps because it is something from Maine. Well, something made in China from Maine. 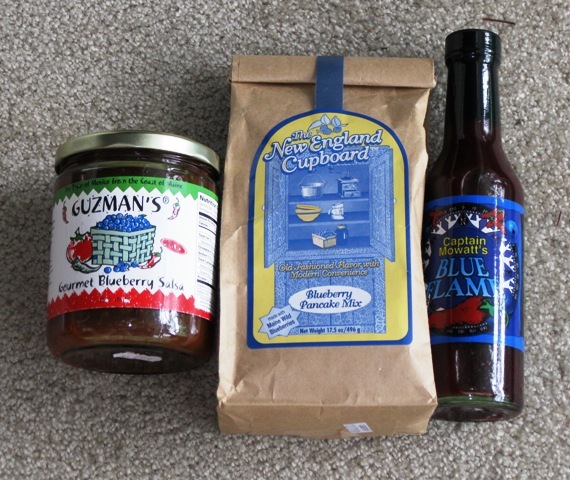 Some blueberry stuff in my California apartment -- Guzman’s Gourmet Blueberry Salsa, Captain Mowatt’s Blue Flame, and The New England Cupboard Blueberry Pancake Mix. This is an occasional multipart series of photos of things related to Maine that can be found in my California apartment. Today’s photo is of some blueberry stuff in my California apartment — Guzman’s Gourmet Blueberry Salsa, Captain Mowatt’s Blue Flame, and The New England Cupboard Blueberry Pancake Mix. The items came to me in a Christmas package from my family in Maine. Christmas packages always contain Maine foods. Several books from my small library on the American Civila War. 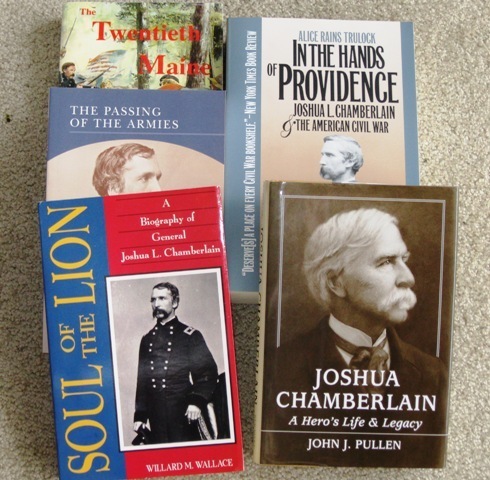 These books center around Joshua Chamberlain, scholar, warrior, hero, and politician. This is an occasional multipart series of photos of things related to Maine that can be found in my California apartment. Today’s photo is of a few books in my small library on the American Civil War. The first set is a series of books related to Joshua Chamberlain, a Bowdoin College professor, who joined the troops from Maine going off to fight in the Civil War. He was given a leadership role in the 20th Maine Infantry Regiment and later, despite having no education in military strategies, became a highly respected and honored officer. He fought gallantly at Gettysburg, leading a bayonet charge in protection of Little Round Top Mountain, was severely wounded several times throughout the war, received the Medal of Honor, selected to accept Robert E. Lee’s surrender at Appomattox, served four one-year terms as Maine’s governor, and eventually died several decades after the war’s end from complications caused by war wounds. These are three fictional novels from my small library on the American Civil War. They were written by Michael Shaara and his son, Jeffrey Shaara. 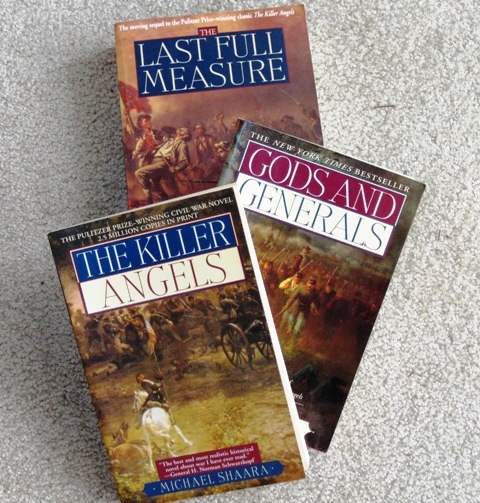 "The Killer Angels" won the 1975 Pulitzer Prize for Fiction and was made into a movie, as was "Gods and Generals." The second photo is also related to Chamberlain, but it is a trilogy of fiction. The first, “The Killer Angel,” was written by Michael Shaara and won the 1975 Pulitzer Prize for Fiction. It was made into the 1993 movie “Gettysburg,” with Jeff Daniels starring as Chamberlain. Shaara’s son, Jeffrey, added the prequel, “Gods and Generals” and a sequel, “The Last Full Measure.” “Gods and Generals” also was made into a film and Daniels stared as Chamberlain in that as well. In “Gettysburg,” besides Daniels, the cast included Martin Sheen (Robert E. Lee), Tom Berenger (Lt. Gen. James Longstreet), documentary film maker Ken Burns (general’s aide), Sam Elliott (Brig. Gen. John Buford), Stephen Lang (Maj. Gen. George E. Pickett), and a bunch of other actors. This is an occasional multipart series of photos of things related to Maine that can be found in Keith Michaud’s California apartment. Keith Michaud shot today’s photos. Don't mind the guy in the photo. He's just "from away." But he does have Maine stuff in his California apartment, including the T-shirt, cup, moose crossing sign, and chili bowl. 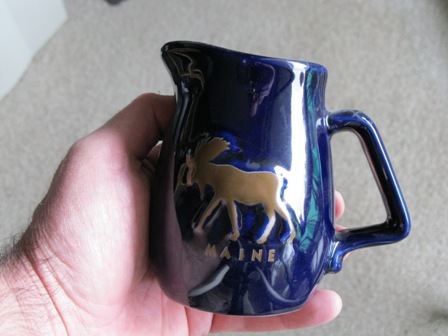 How could you have a set of photos of Maine stuff in a California apartment without having some of moose stuff. You may notice that there is no question mark after the previous sentence. That’s because it was so obviously rhetorical that I didn’t bother with one. Moose and Maine go together like, well, blueberries and Maine and lobsters and Maine and trees and Maine and … well, you get the point. Yes, I have moose stuff from Maine in my California apartment. You will notice in the top photo alone that I am wearing a T-shirt and holding a cup with moose on each. The phrase on the cup reads “Moose Country: I brake for moose,” which is a great idea, breaking for moose, that is. Those gangling, clumsy, majestic monstrosities of Maine can do much damage to a vehicle – and the vehicle occupants – in a collision. They are best avoided on the road. 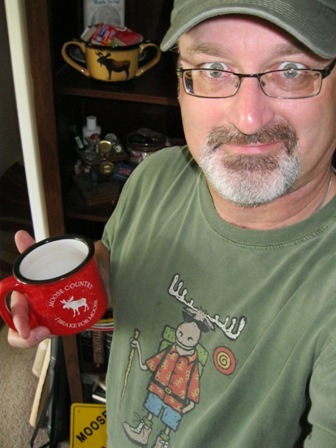 Anyway, back to the photo, you’ll notice a moose on a chili bowl on the shelf behind me. It’s currently holding stick matches for cigars. And there’s a moose crossing sign on the floor. 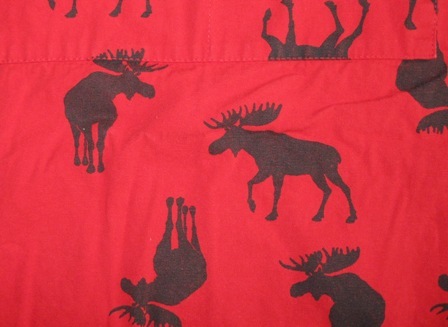 I’m pretty sure I still have a T-shirt with a moose crossing sign on it, but I can’t recall just where it might be. 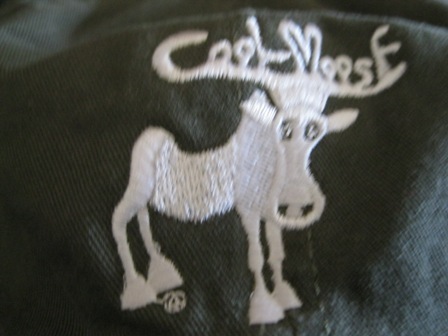 I’m also wearing hat with a moose on it with “Cool Moose” written in the moose’s antlers, but I seem to have inadvertently cropped that out of the photo. Just take my word for it. I’ve included a few other photos of moose stuff from Maine in my California apartment. Here's a closer look at the chili bowl. My sister sent it to me this past Christmas. Or the Christmas before. I really didn't want to eat chili out of it so it currently holds stick matches I use for cigars. 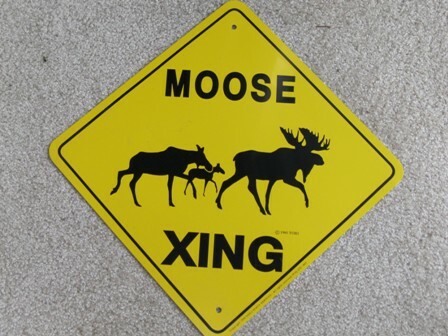 Here's a closer look at the moose crossing sign. I am pretty sure I still have a T-shirt with the same design on it. This is the design on the hat I'm wearing that was cropped out of the top photo. I posted a photo of the hat earlier. 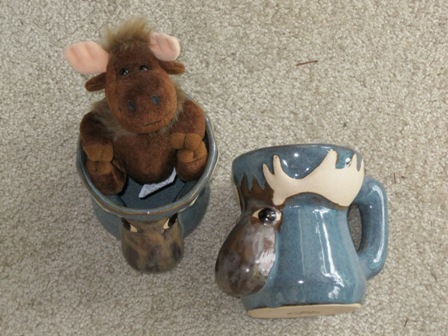 I receved these lovely moose coffee cups this past Christmas. I love 'em because they desplay the essence of the moose. And there's a stuffed moose sitting in the cup on the left. I don't recall when or where I received the moose, but it is cute. At least, as far as moose go. 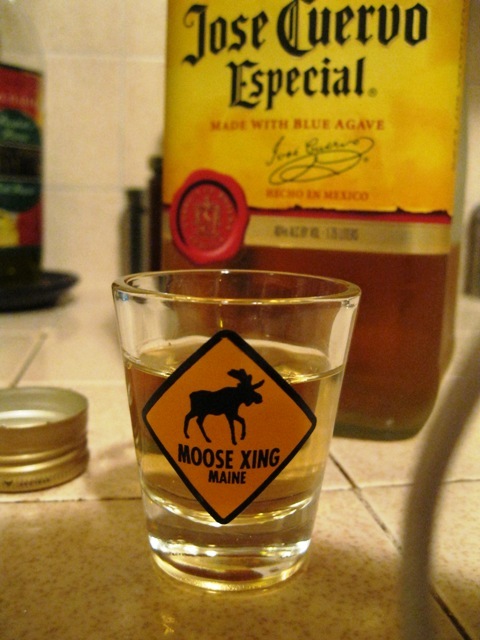 Oh, yeah, moose go with Maine like maple syrup goes with Maine. 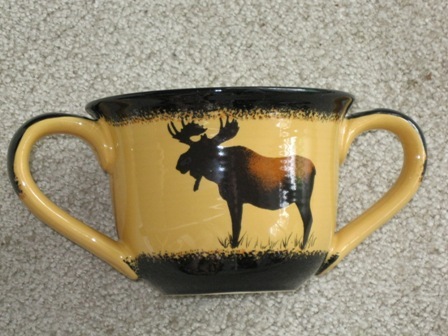 Here’s a maple syrup pitcher with a moose on it. This is the first photo in an irregular series called "Maine stuff in my California apartment." It includes a book of a history and heresay and a cookbook to mark Portage, Maine's centennial. And a cookbook to mark the centennial of the local Catholic Church parish. This is the first photo in an irregular series called “Maine stuff in my California apartment.” It includes a book of a history and heresay and a cookbook to mark Portage, Maine’s centennial. And a cookbook to mark the centennial of the local Catholic Church parish. I’m launching a new feature today on Letters From Away. I’m calling it “Maine Stuff in May California Apartment.” From time to time, I will photograph and share stuff from Maine or related to Maine that can be found in my California apartment. Um, I suppose you probably figured that out from the title of the series. Most of the Maine Stuff may seem insignificant to some, but it is my stuff and it means something to me. I suppose it means something to me because the Maine Stuff helps me maintain my tie to that emerald jewel of a state. I’m not sure how often or how regularly I’ll post Maine Stuff photos on Letters From Away, but the other night I took about two dozen photos of Maine Stuff and I didn’t even leave my living room, so there is Maine Stuff aplenty in this apartment. Look for at least one new Maine Stuff in My California Apartment at least once a week. Enjoy! Or not. It’s your choice. 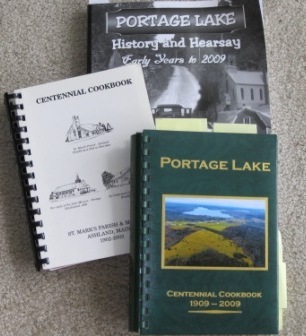 Today’s photo shows three books found in my California, a book of history and heresay and a cookbook marking the centennial of my hometown of Portage located on Portage Lake in Aroostook County and a cookbook marking the centennial of the St. Mark’s Parish and Missions. Portage turned 100 last year and St. Mark’s – including Our Lady of the Lake Catholic Church in Portage – turned 100 in 2002. Fun stuff in the history book and yummy stuff in the cookbooks.